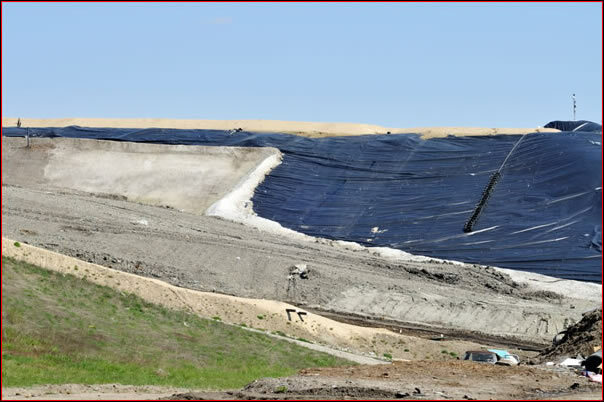 ETP standard or custom fabricated daily landfill covers are the landfill operator’s best choice. Why? Because ETP gives the landfill operator a choice of landfill cover products, sizes, service, product life and costs designed to meet his needs. ETP’s standard and custom fabricated covers are produced from woven and coated woven fabrics that exhibit a range of durability, toughness and water repellance to meet varying needs of cover weight, useful life and cost effectiveness. One of ETP’s daily landfill cover products will meet your needs. Use our “RFQ” form to detail your requirements or call. Our covers replace more expensive soil covers while protecting your active cell. With ETP standard and custom daily landfill cover there is no need to surrender precious space or time to daily closure operations. Easy to install and remove, the ETP daily cover aids the landfill operator in the most efficient operation of the landfill. Standard ETP daily landfill covers are ready for shipment within five working days after receipt of order and credit release. The standard ETP daily landfill covers are available in 50 by 50 feet and 50 by 100 feet sizes. Because no two daily landfill covering requirements are exactly alike, ETP builds custom fabricated covers from a variety of materials. Custom fabricated covers are shipped promptly (normally ten working days from receipt of order and credit release).